RALEIGH — The N.C. Wildlife Resources Commission’s Home from the Hunt campaign reminds hunters to practice safe and ethical hunting as wild turkey season opens April 14 and continues through May 12, preceded by a youth-only week from April 7 through April 13. The daily limit is one turkey and the possession and season limit is two turkeys per hunter, only one of which may be taken during youth season. Hunting is only allowed for those younger than 18 years of age during the youth season, but hunters age 16 and 17 must be properly licensed. Each youth must report a harvest to the Wildlife Commission through a Big Game Harvest Report Card. License-exempt youths should report their harvest using a Big Game Harvest Report Card for License-Exempt Hunters. Those under the age of 16 are exempt from license requirements provided they are accompanied by a licensed adult at least 18 years of age. If youth are properly licensed or have successfully obtained a hunter education certificate, they may hunt without the supervision of an adult. 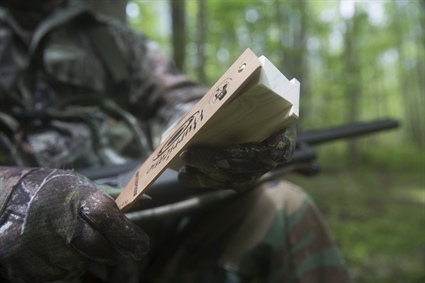 The commission encourages turkey hunters to follow basic safety guidelines, such as keeping their firearm muzzle pointed in a safe direction and positively identifying their target before pulling the trigger. Never stalk a turkey, which only increases your chances of being mistaken for game. Leave the area (wearing blaze orange) if you think another hunter is already there. Alert another hunter to your presence by saying “Stop” in a loud voice. Never wear red, white, blue or black in the field — the colors of a tom’s head and body. Make sure your decoy or harvested turkey isn’t visible when walking through the woods, wrapping them in blaze orange to avoid misidentification. Report harvests using the Big Game Report Card. Use of pistols, rifles or black powder rifles is prohibited. Dogs are not allowed for hunting wild turkey. Hunting is not allowed where bait has been placed until 10 days after all bait has been consumed or removed. Electronic or recorded calls are not allowed for hunting wild turkey. Anyone who witnesses suspicious activity such as poaching or baiting may be eligible to receive a reward (up to $1,000) by reporting information that leads to a conviction to the Turn-In-Poachers program. For more information on eligible violations and how to submit a tip, visit http://www.ncwildlife.org/wildtip. Regulations and restrictions on turkey hunting, including information on youth season, are available in the 2017-2018 Inland Fishing, Hunting and Trapping Regulations Digest, beginning on page 58, and available online at www.ncwildlife.org.